The picture collage is from Saturday when I went to Bournville in Birmingham to help campaign for UNISON NEC member and NHS worker, Mary Locke, who is standing to be a local Ward councillor in the May 5 elections. Yes, Bournville is the home of the Cadbury's chocolate factory and residents told us how they can sometimes smell the chocolate beans being roasted depending on the wind direction. Mary is the nicest, most sincere and hard working UNISON rep I have ever met. She will be in my opinion, a brilliant local Councillor. The ward currently has 2 Tory Councillors and one Labour (who is standing down due to ill health). Only one seat is up for election this year so it will be a straight fight between Mary and her Tory opponent. Over 20 Labour Party activists turned up to help, including UNISON Vice President, Carole Sewll and the West Midlands Regional Secretary, Ravi Subramanian. We were carrying out a survey of residents on local issues. It went down very well and I will think of suggesting doing something similar in West Ham. There was some 750 contacts made that day. 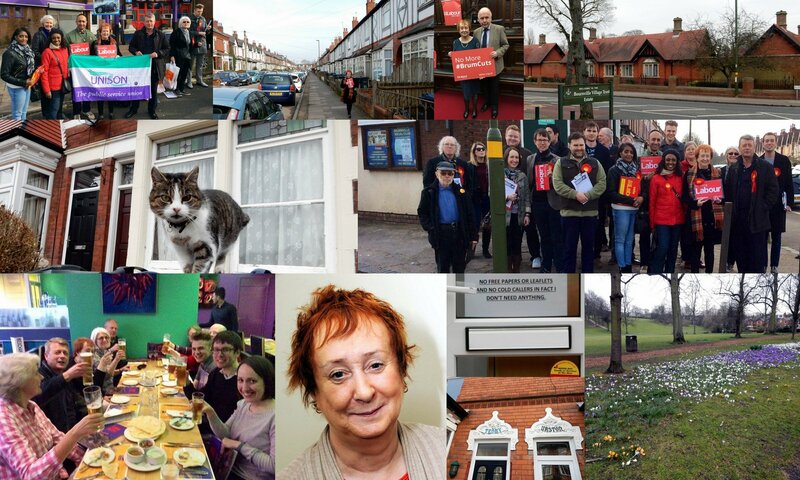 I enjoyed chatting to local residents, who by and large, were pleased to be asked their views on local issues. They were not shy in expressing themselves either! I like coming to Birmingham and have been to see union members here fairly often in recent years and always look forward to it. Apart from the Chocolate factory, Bournville is famous for being a "model village" built by the original Quaker owners of Cadbury for its workforce. As someone who works in housing I was impressed by the well built family sized homes with decent gardens. There is still no pub in Bournville due to its Quaker tradition. After the canvass, many of us went for a meal at a local restaurant, which I think is a marvellous way to end such a day. Another thing I will suggest that we adopt in West Ham. Check out Mary's website https://marylockelabour.wordpress.com/ and contact her to volunteer to help.